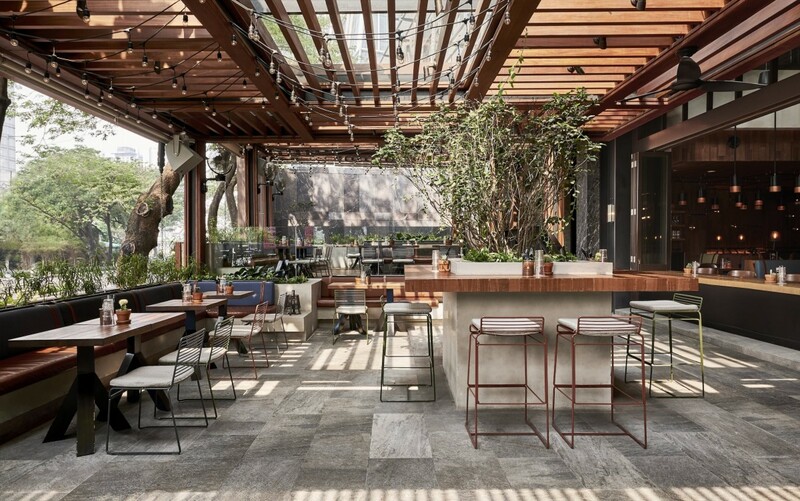 Alila SCBD Jakarta officially opens on February 6, 2019, presenting a cool urban retreat concept with dynamic choices to meet the expectations of lavish lifestyles and offer a treat to the city’s food enthusiasts. Making its mark at the heart of the Indonesian capital’s dynamic lifestyle and business district, Alila SCBD Jakarta is set to host an array of sophistication certain to meet the expectations of those seeking to further their upscale living while also catering to those looking to elevate their dining experiences with a selection of one-of-a-kind restaurants slated to be the new sensations in town. At this prime new location, the Alila Experience begins with the hotel’s striking facade that mixes an overlapping pattern of aluminium sticks and canopies, creating unique lines and shadows that gives a sense of illusion for those passing by. The building’s shape translates into different room configurations, with each studio and suite featuring picture windows showing the ever-vibrant city of Jakarta. Just before the hotel’s entrance, ‘Orbital of Joy’ by Yogyakarta-based art duo Indieguerillas are mounted on the wall, with the work’s six pieces representing travellers who are on their own personal journeys. 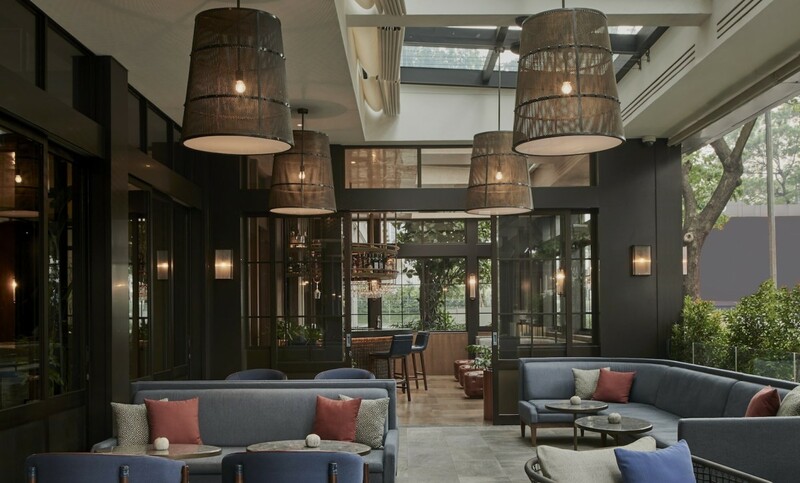 Each of them can be seen hugging a geotag icon, symbolising a spot for a stopover and a break that one takes to recoup energy during a journey – perfectly illustrating the hotel’s aspiration as an urban retreat for their guest’s sojourn. 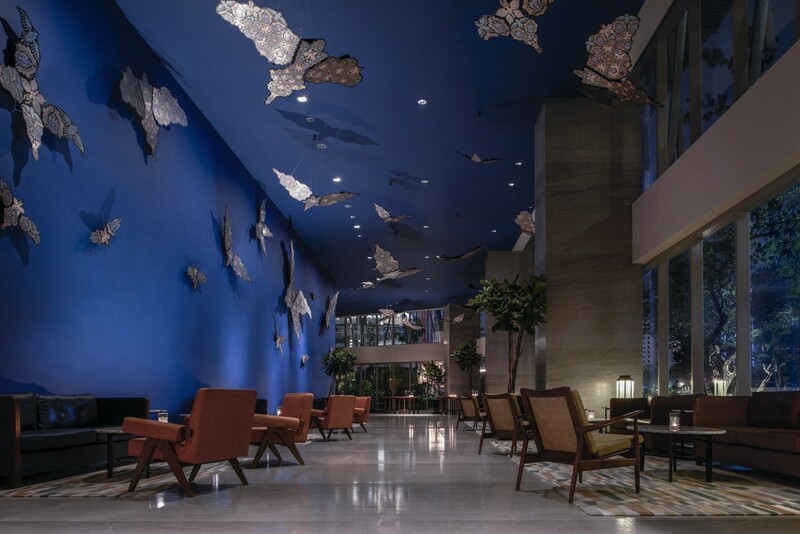 The lobby of Alila SCBD Jakarta features ‘Birds, Bats and Butterflies’ art installation by Australian-born architect and artist Richard Hassell. Each creature depicts something different. Butterflies, for example, symbolise long life, beauty and elegance. Upon entering the lobby, guests are treated to the ‘Birds, Bats and Butterflies’ art installation in the living room-styled space. This particular artwork was created by Australian-born architect and artist Richard Hassell, who co-founded the award-winning WOHA Architects. For the piece, Hassell reportedly gathered inspiration from Southeast Asian textiles. Beautiful and artistic interiors, however, only make up one part of Alila SCBD. The hotel’s debut on February 6 also marks the opening of Jakarta’s new and hip restaurants. Guests are invited to revel in New York-inspired dining experience from Michelin-starred chef Jean-Georges Vongerichten and son Cedric, with the options of either Le Burger or Vong Kitchen, each unique to its own. Vong Kitchen offers a New York-inspired dining experience from Michelin-starred chef Jean-Georges and son Cedric, with curated menu featuring a selection of seasonal and signature dishes made from fresh local ingredients. At Vong Kitchen, diners will be treated to a curated menu served in a New York Grill-style establishment. Promising fresh local ingredients in seasonal and signature dishes delivered from an open kitchen, the flavors of modern French-American cuisines they serve will undoubtedly attract the town’s curious foodies. As for those dreaming of a casual burger bar concept akin to those in Manhattan, the atmosphere and food options at Le Burger will be the dining choice for any meal of the day, catered for a laid-back experience that fits a missing puzzle in the bustle and hustle of Jakarta. The 24-hour ‘Le Burger’ brings into town a New York Grill-style experience. Patrons will find themselves immersed in Manhattan vibes through interiors designed by New York-based Rockwell group. Alila SCBD will also house the 12th Hakkasan restaurant, poised to be leading the capital’s fine dining experience through its innovative Cantonese cuisine, cocktails as well as an extensive wine selection. Hakkasan Jakarta will open on February 8th with an unparalleled rooftop bar and lounge from Alila SCBD’s 25th and 26th floor; making this open-air venue a new hot spot for post-work drinks, or an unforgettable evening out in the metropolitan. Get ready for a range of experiences you won’t forget by immersing yourself in the new Alila SCBD. Reserve today and enjoy the ‘Dream it, Wish it, Do it’ opening offer which begins with IDR 2,500,000 nightly rate, valid until the end of February. For further information and reservations, email scbd@alilahotels.com, or visit www.alilahotels.com/scbd.